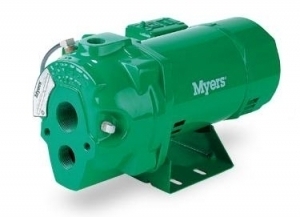 The Myers HJ Series Pumps are some of the most popular Water Jet Pumps that you will find. The reason they are so popular is because they are very dependable and very cost effective. You can also get many different models of the HJ Series depending on what kind of performance you need. Another great thing about the HJ Series Pumps is that you can use them whether you are trying to get a pump for your home or for an Office Building. 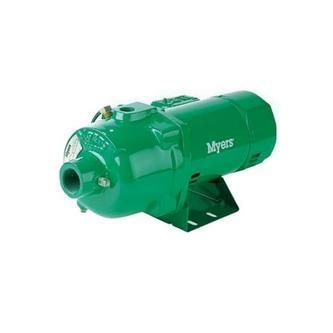 These Myers Jet Pumps can be used for both Shallow Well and Deep Well Applications. The Shallow Well Jet Pumps are great for running your Home Water System or even your Irrigation System. Your Pump will be able to pull water from as low as 25 feet under the ground (so make sure you know how deep your well is). When choosing which pump you need it is important to consider the Specs of the pump to make sure it will provide what you need. You can check these Shallow Well Specs below. The Deep Well Pumps are very similar to the Shallow Well Pumps but they are good for some other applications such as Agriculture and Sprinkling. If your Well is a little bit deeper than the Shallow Pump can handle then you can use this pump to pull water from up to 100 Feet. *When choosing the right Pump for you it is important to consider how HP (Horse Power) will affect your Electric Bill. If you are running more HP than you need you are likely going to be paying much more than you should on your Electric Bill.